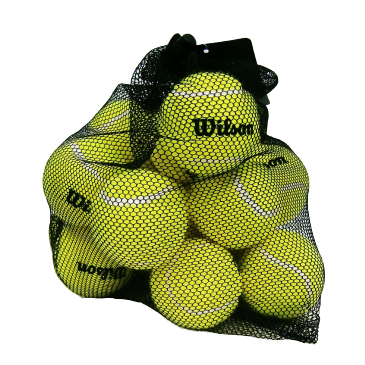 Wilson Pressureless bag of 18 Tennis Balls : The Wilson Pressureless bag of 18 balls are the perfect set for teaching, ball machines and general practice. These special balls feature a higher density woven felt so you get more use from them. Includes a mesh drawstring carrying bag. Durability of logo on Tennis Balls - Our tennis balls are printed using the best techniques and processes available. The print will be durable to touch and display but will wear with general play on abrasive surfaces.